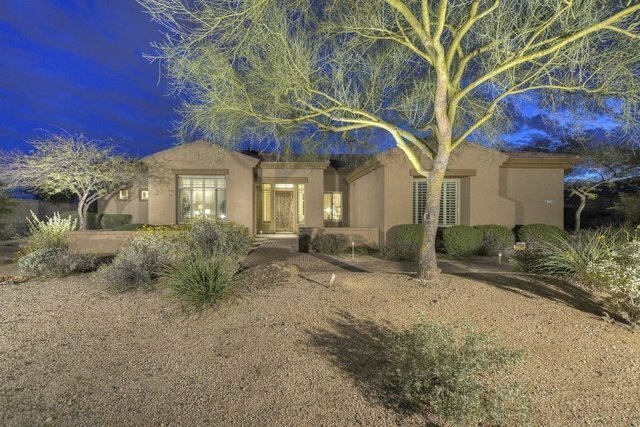 Located in the very desirable heart of North Scottsdale, gated Vista Monterey is minutes from great shopping, fabulous restaurants, sought after schools and premium healthcare. Light and bright, this beautiful south facing home is very spacious and functionally designed, offering a split master and den on one end of the home and a guest bedroom wing with four generously sized bedrooms, two baths and a bonus/game room at the other end. An entertainer's dream kitchen was updated in 2016 to include white cabinets, an enlarged island with white and gray quartzite natural stone countertops and features stainless appliances such as SubZero® refrigerator, gas cook top, double ovens and wine refrigerator. Entertain seamlessly between the indoors and expansive outdoor backyard with its large grassy area, oversized pool, fire pit, built-in BBQ and fabulous mountain views, not to mention a separate and private dog run with its own doggie door! The four car garage is also a plus with its quality and many built-in cabinets. You will not be disappointed!